The last week has been a blur. The chickens began laying eggs, I played host to several friends and coworkers who were visiting for the weekend and Brae started school, thank goodness! She has been antsy, bored and grouchy the last couple weeks. After three months of free time she was craving a new routine with some structure. Now she comes home much happier after spending the day with her friends and challenging her brain with new facts. My pregnancy is progressing perfectly so far. When I was pregnant with Brae life was a nightmare. Tom and I were on the verge of homelessness, his mom was dying of cancer and passed away a couple of months before my due date, and I had relentless morning sickness throughout my entire pregnancy. On top of that I had just opened my own business the year before and unexpectedly had to quit working 4 months earlier then I had planned, putting an even bigger wrench in our finances. I won’t get into too many specifics of that labor and delivery, but will say that it was traumatic. The hospital anesthesiologist messed up my epidural which caused me to have a much more painful labor, delivery and recovery than normal and I had to return to the hospital a couple days later to have another operation to fix their mistake. The whole experience was a total nightmare. Which is why Brae is almost eight years old and we are finally having a second child. This time around I have a midwife and we are going to a birth center instead of the hospital. I am really excited about having a medicine free birth. I will be able to do it my way instead of being pigeonholed into a hospital regimen that fights a woman’s natural ability to give birth rather than trusting a woman to labor on her own. I have learned so much about women’s natural ability to bear children without things like epidurals, pitocin, and episiotomies. I am thrilled I will get the chance to do this all natural, in a calm and soothing place, and with a skilled midwife who will be with me the entire time instead of barely making it in the room to catch the baby. I have about 6 1/2 weeks left until then and time is flying by. Many women at this point in their pregnancy are cleaning the baseboards, organizing the closets, and washing baby clothes. But not me. I have been baking. When boredom hits I head to the kitchen to experiment with a variety of blackberry recipes I have been saving up for the harvest. 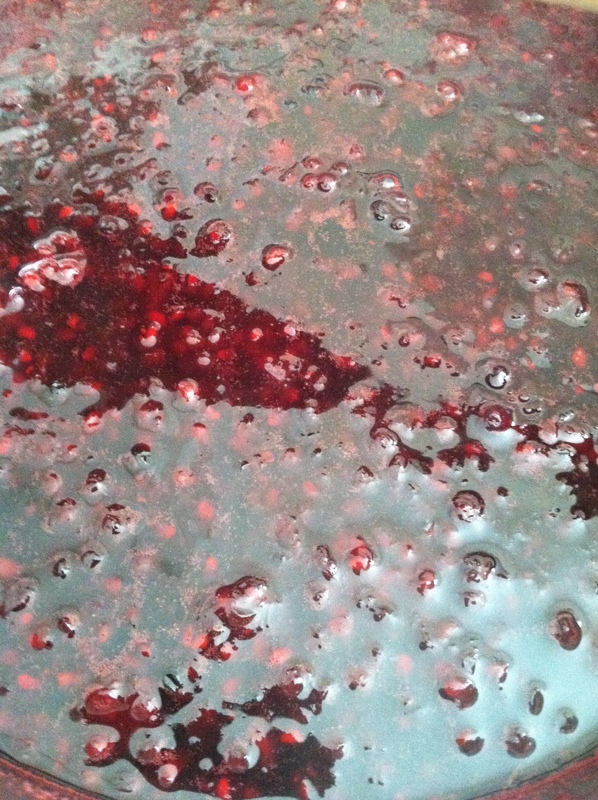 The past few weeks we have been harvesting blackberries several pounds at a time. Most are immediately washed and frozen using this method, but many are making their way into muffins, quickbreads and preserves. 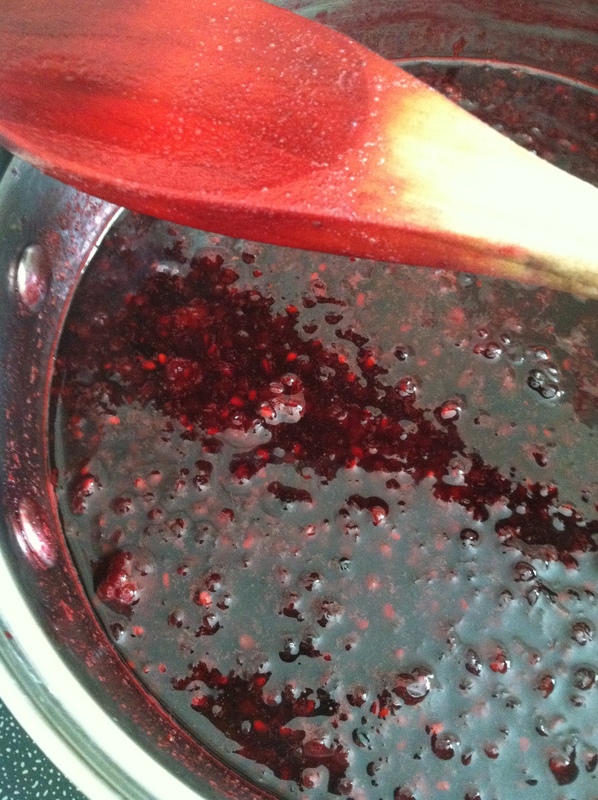 So far my all time favorite blackberry recipe has been blackberry syrup. 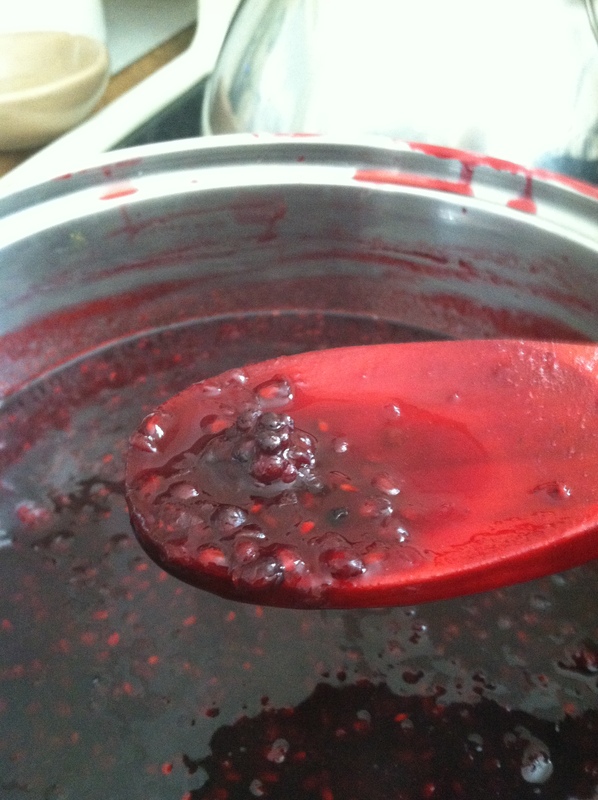 This blackberry syrup was one of the tastiest treats I have made in a really long time. We all agreed that it hardly tasted like any particular berry, but more like some exotic elven berry you would have during breakfast while visiting Rivendale. Its tart and sweet at the same time and just a little swirl of it over pancakes, french toast or oatmeal is the perfect start to my day. It makes butter, jam and maple syrup totally unnecessary. Plus it’s not that hard to make! 1. Combine all ingredients except the cornstarch in a medium saucepan. Cook over medium heat stirring occasionally until the sugar is melted and the mixture begins to boil gently. 2. Turn heat down to med-low and simmer for about 20 minutes. 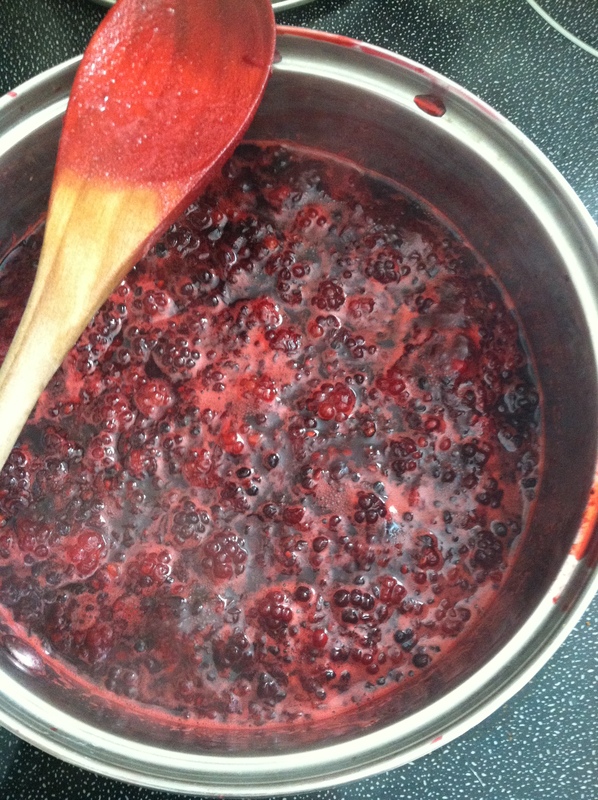 Stir often and crush the berries with a wooden spoon or potato masher as they cook. 3. When the mixture begins to thicken take off the heat and stir in the cornstarch. Strain the syrup through a sieve to remove the seeds. 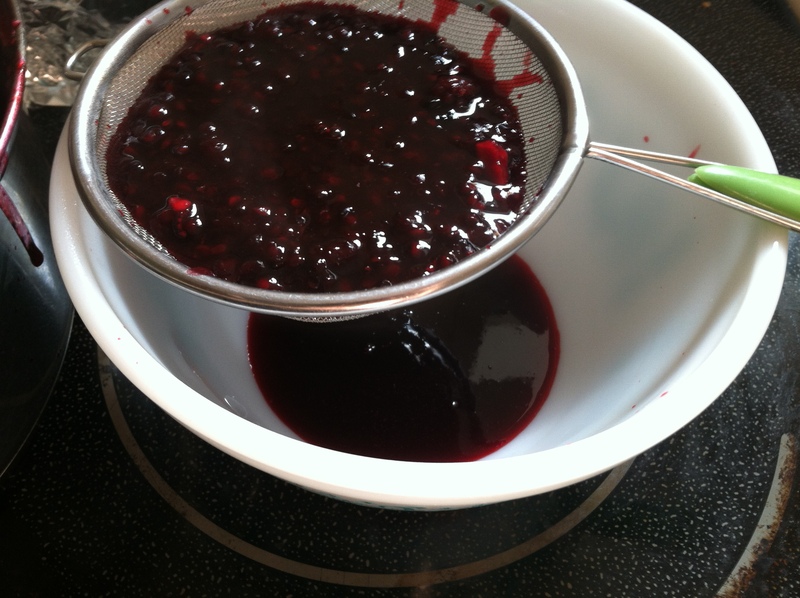 Smash the berries in the sieve to get all the pulp you can off the seeds. 4. Stir well and store in a glass mason jar with a lid. Can be frozen in a canning jar or stored in the fridge for several months.